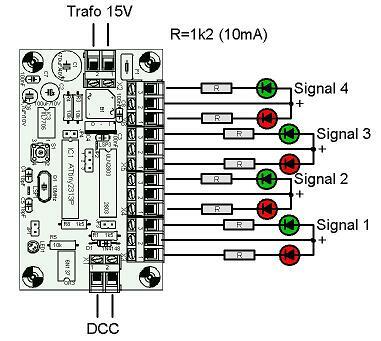 This software allow for the control of signals, whereby dimming is used during the change between different aspects. The characteristics of dimming are adjustable, the brightness over time corresponds thereby to real bulbs. Additionally there is a mode for railroad crossing with control of a Faller Car magnet. 4 flashing lights (for railroad crossing, pedestrian crossing), additional control of a stop magnet for Faller Car. The setup of the operating mode and the address takes place simply by pressing a tracer and sending a turnout instruction. The content (coil and thrown/closed) of this first received command determine then mode of operation and address. After pressing the programming tracer for at least 100ms, the LED is turned on. This indicates that the decoder is ready for the receipt of a programming instruction. Example: Sending the switch instruction '18 red' results in the base address 4. (the decoder will 'listen' to the switch addresses 17-20 will run in the mode 2. Generally, OpenDecoder doesn't need any pause between instructions. This applies also during dimming! (One can find decoders on the market, which are offline after an instruction for 400ms ;-). With every mode the outputs for the previous aspect are dimmed down, then the new aspect is dimmed up. The SignalDecoder evaluates only 'coil on' commands, 'coil off' commands are ignored. In this mode four light signals with two aspects are controlled. In this mode two light signals with three aspects each are controlled. The light signals are connected directly (without additional diodes) to the decoder. In these modes of operation a station entry signal and a announcement signal are controlled. The station entry signal has four aspects: Hp0, Hp1, Hp2 and Sh1. 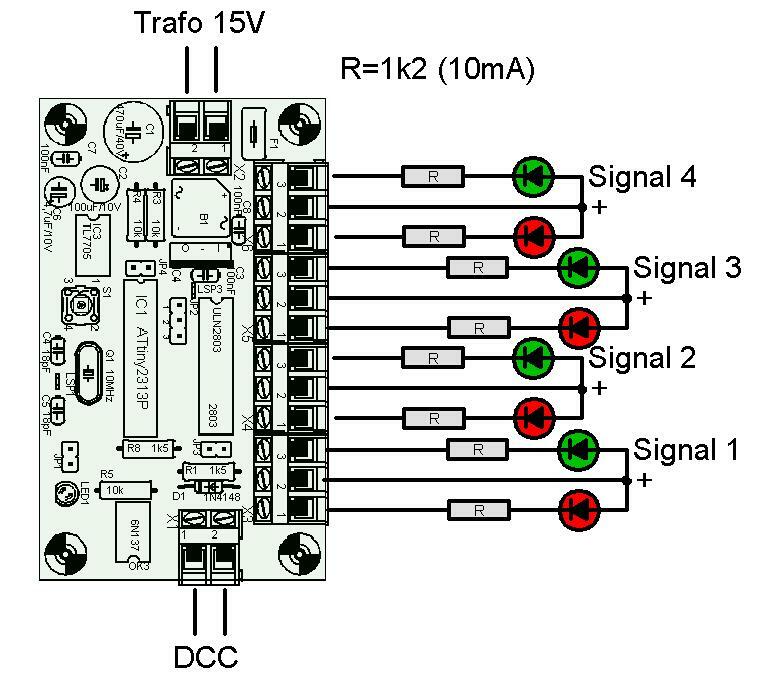 If the announcement signal and station entry signal are mounted at the same location, then the announcement signal is dark while the station entry signal is showing Hp0 or Sh1. The dark palpation of the announcement signal only takes place in mode 3, mode 2 is intended for two independent signals. control light at the track: there is a signal (BÜ0/BÜ1) showing to the engine driver that the St Andrews cross also is flashing. This signal is equipped with a white light, which begins flashing shortly after the flashing at the crossing. On these signals there is another yellow point; it replaces the light for 'ready for operation' used in former times. Stop magnet: This output controls the magnet for Faller Car. This output is activated approx. 2s after flashing and remains switched on 2s longer . --> identical to the switching decoder, however the lights are softly dimmed on transistions. If the jumper is fitted in the respective modes, then the last valid state is stored in the EEPROM. See the explanations on the software in general. Dimming speed and delay can easily be adjusted with the compile time constants DIMM_DOWN_SPEED, DIMM_UP_SPEED and DIMM_UP_DELAY. The ramp and delay are set up for the normal signals with the function set_new_light_val; This function only needs two bit fields: one showing the new state, the other showing the affected outputs. Thus it should be easy to realize a decoder for different aspects. The examples 'railroad crossing' and 'traffic light' show the configurableness and efficiency of the timing engine as well as the dimmer engine. Further examples are to be found in the effect decoder. Download hexfile and source code (V11) contains also special version for Belgium signals.